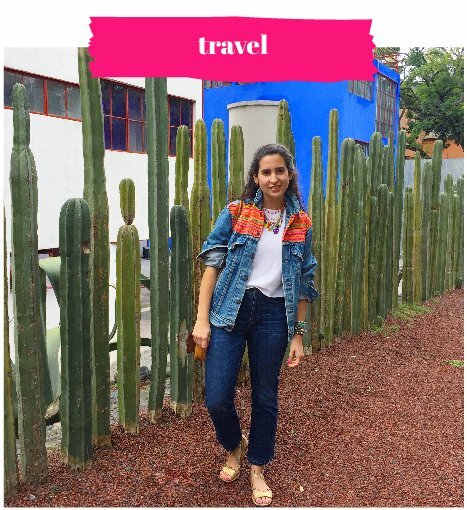 You guys, I am SO excited to introduce Liz of Fancy Flamingo Design – our first guest contributor in longgg time! 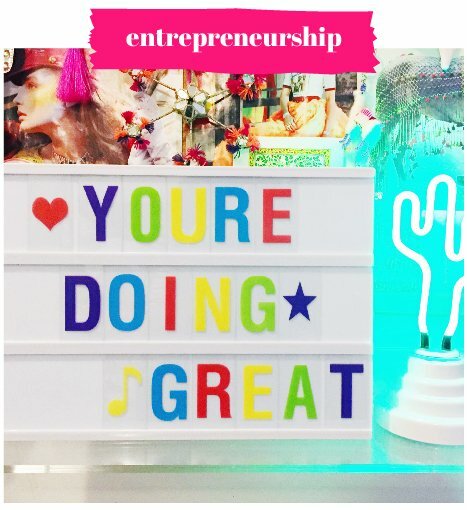 I discovered Liz’s ridiculously adorable creations on a late-night Instagram binge and I’m pretty sure I DMed her immediately to let her know how much I love her work / that we’re most definitely kindred pom-tassel spirits. 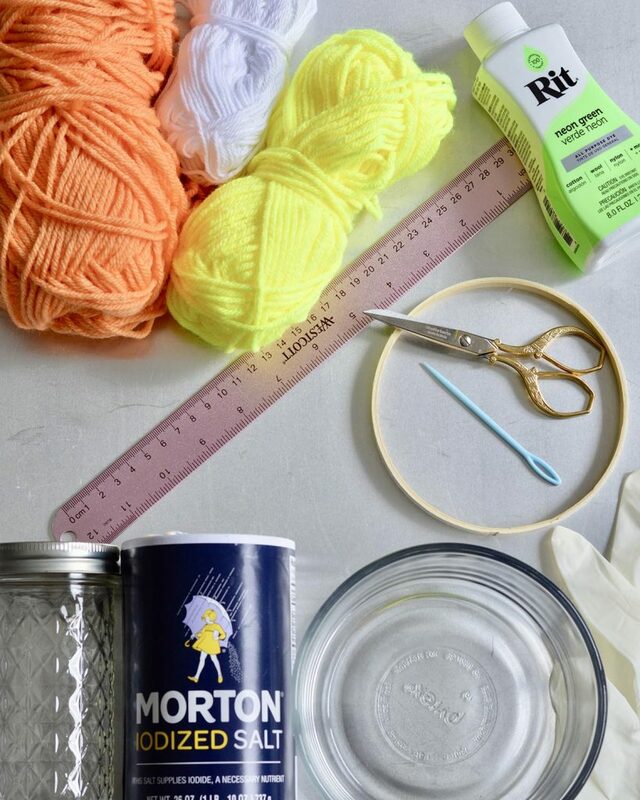 Liz was awesome enough to share a number of her design tricks of the trade, namely her tips for dip-dying tassels (with neon dye, no less!!) 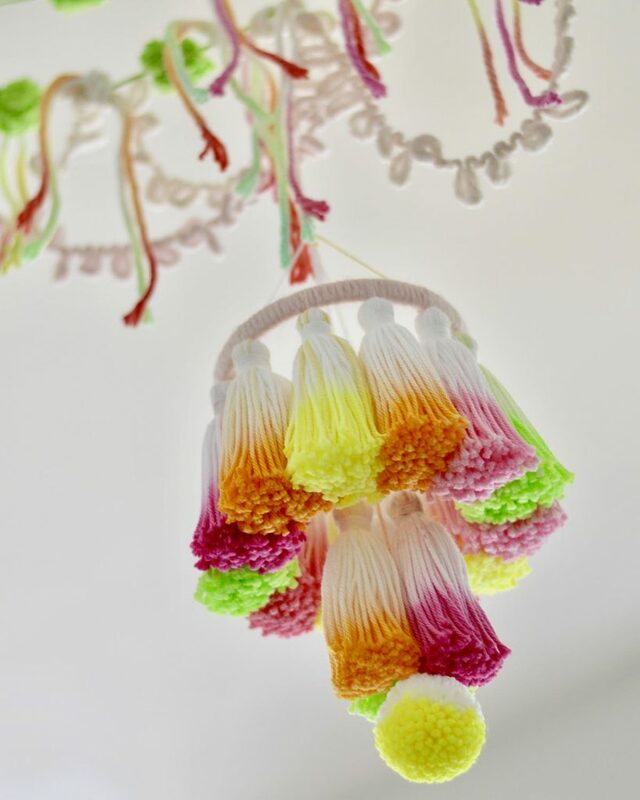 and how she constructs her incredible tassel chandeliers. 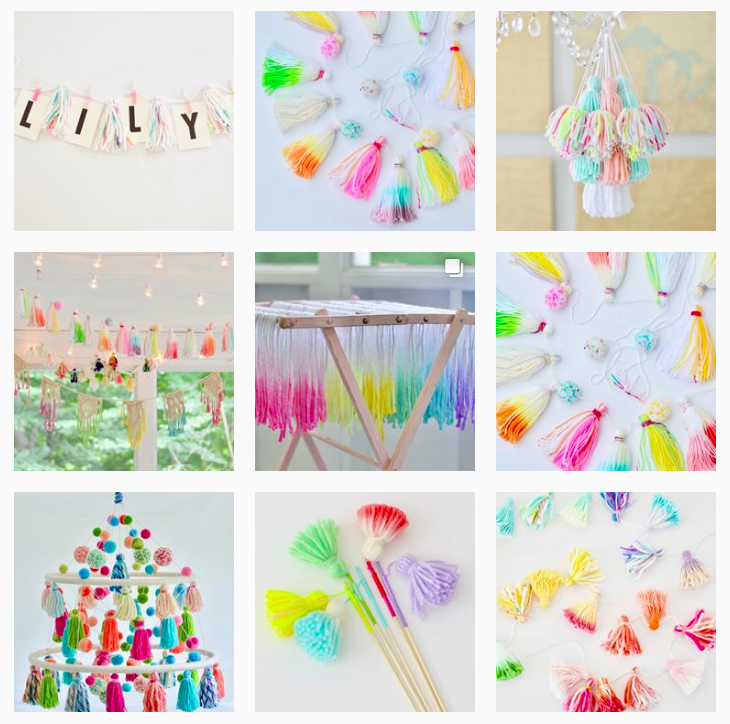 Also, as a special treat to encourage you all to try out this epic DIY, this week we’re offering 10% off both tiers of our virtual pom pom & tassel course, How to Master Pom Poms & Tassels, with code FLAMINGO10! 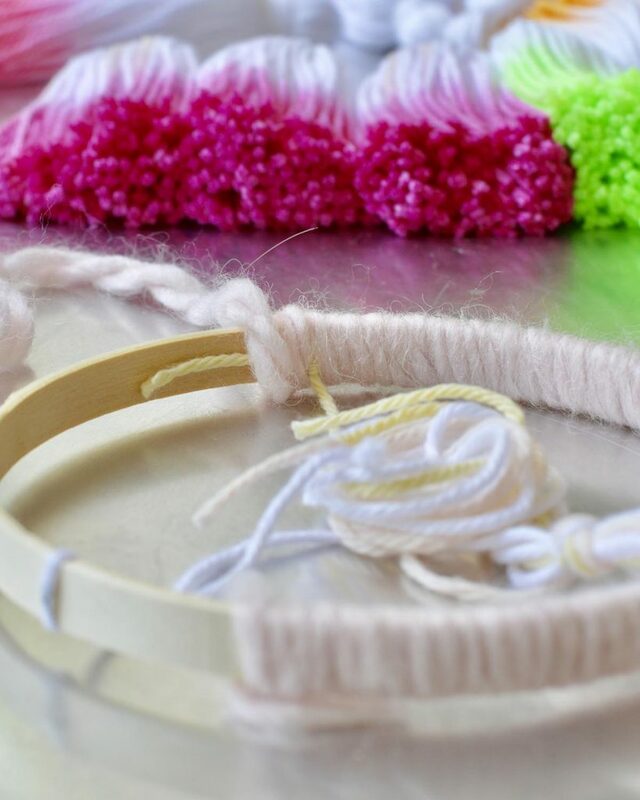 The course features an entire module on our recommended method for making professional tassels plus how to make a two-tone pom pom with our “stripe” method. This offer expires on 9/19 so if you’re been thinking about signing up, now’s the time! Alright, without further ado, I’ll let Liz take it away!!! Hey there, TNTP fans! I’m Liz, from Fancy Flamingo Design. 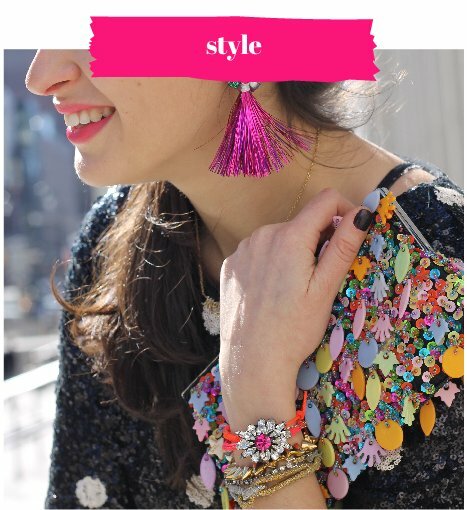 My Etsy shop is full of colorful yarn tassel and pompom creations, so when Marisa and I connected, I knew that something great would happen. 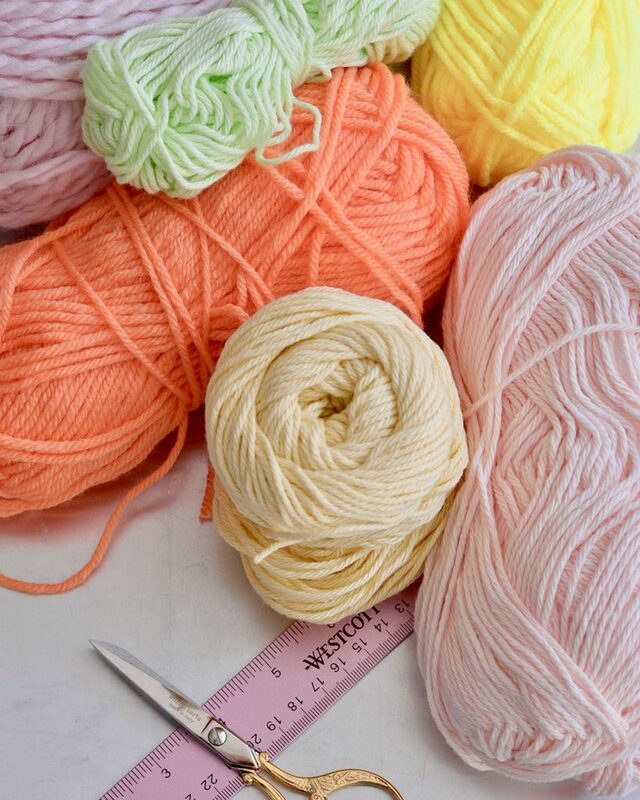 Fancy Flamingo Design is the love child of an empty nest and a passion for color – now, yarn is literally and figuratively filling my empty nest. 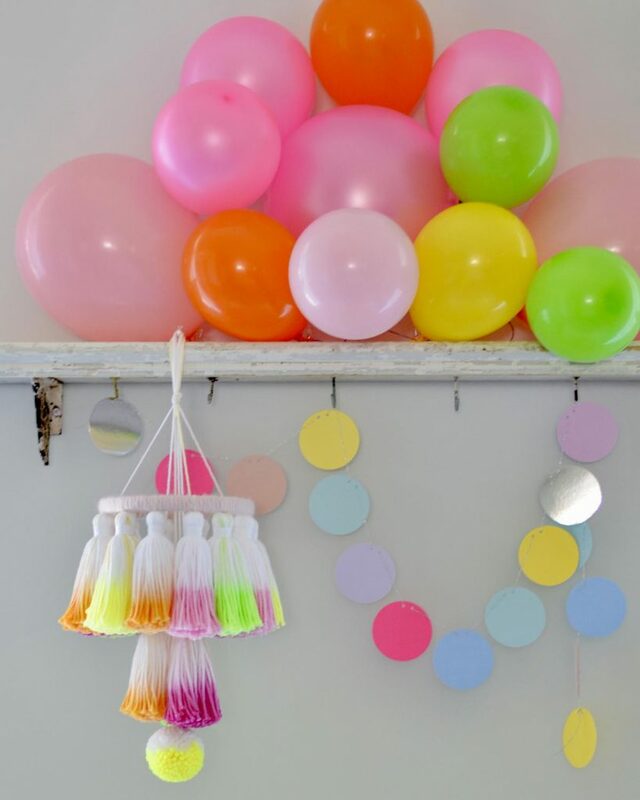 🙂 My favorite thing about yarn tassel and pompom garlands is that they can start life as a party decoration, and then become a permanent part of your home. I love the tradition of taking out the same birthday garland every year, for every birthday in the family. 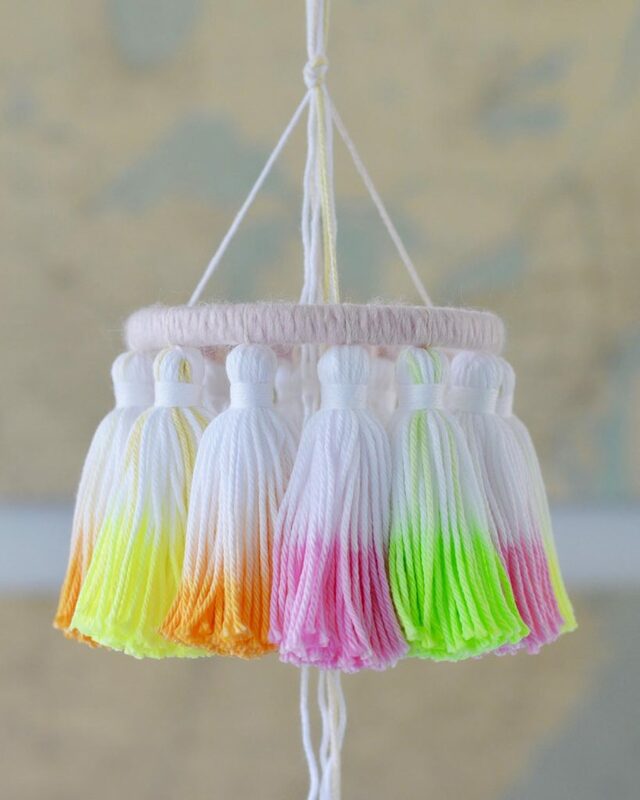 I am currently obsessed with dip-dying, over-dying, and reverse-dying – adding color and removing color can take tassels and poms to the next level. Want to get in on the fun?! 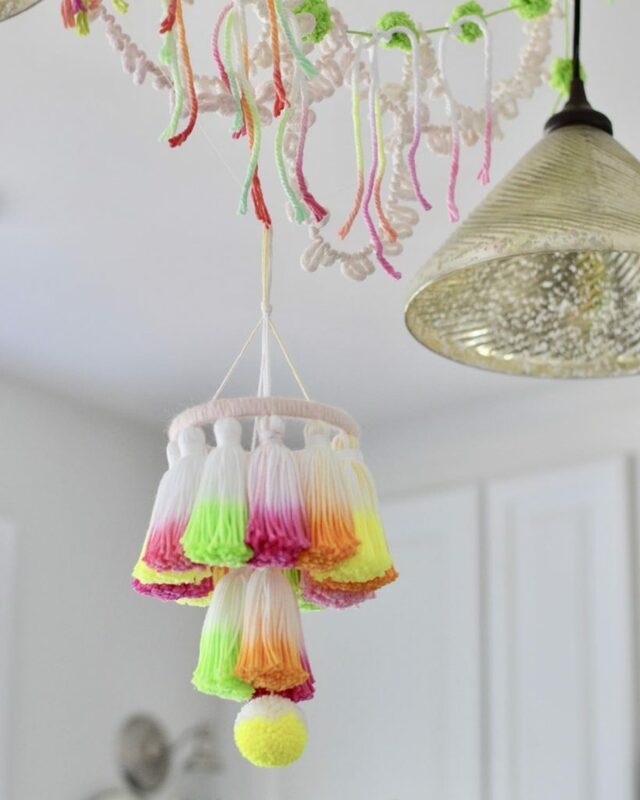 I am going to show you how to make a dip-dyed tassel mini chandelier. There are so many places to hang one of these beauties in your home! I dream of a cluster of these hung at different heights in the corner of a sunny living room – each slightly different, but all with the same color palette. 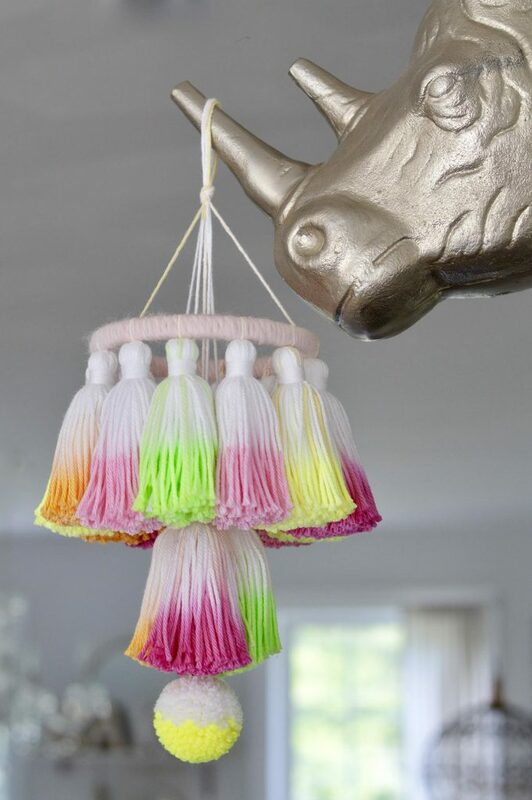 And how perfect is a tassel chandelier as a statement piece when decorating for a party?! This project, though simple, will span a few days since we are dying tassels and letting them dry before we build our chandeliers. 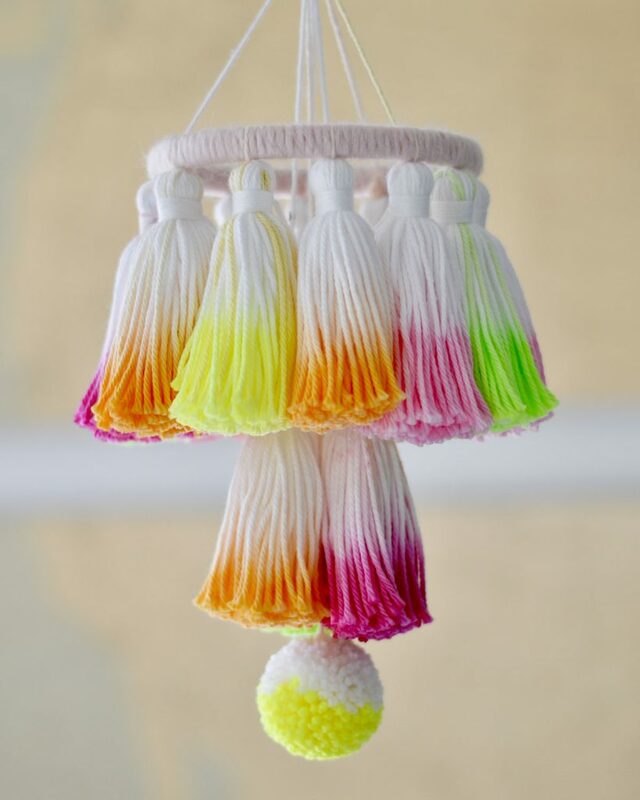 Part one will be the creating and dip-dying of the tassels, and part two will be the creation of the chandelier. 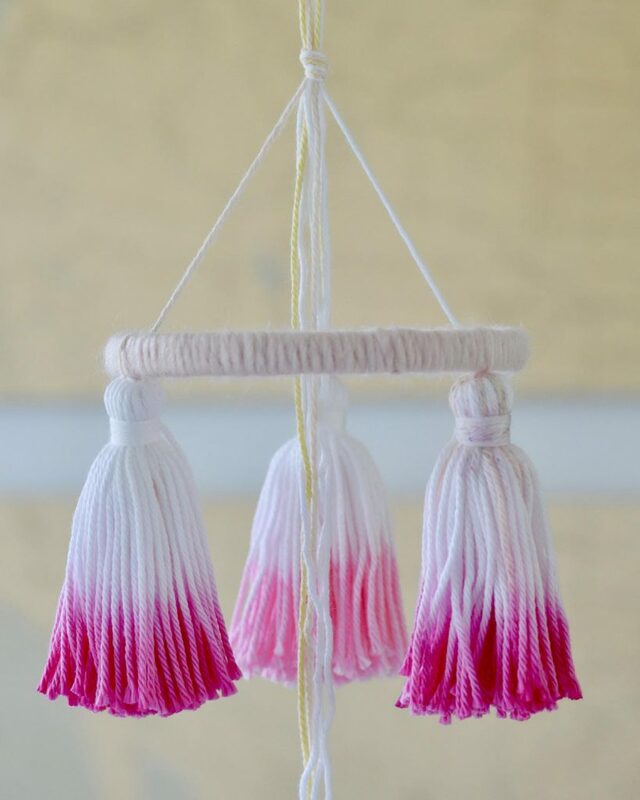 Feel free to make this project your own – skip the dip-dying if you want a quicker project, or dip-dye your tassels with two colors if you have more time! I am using TNTP’s signature festive brights as inspiration, but adding in a few softer shades (I call them frosting colors) for contrast. 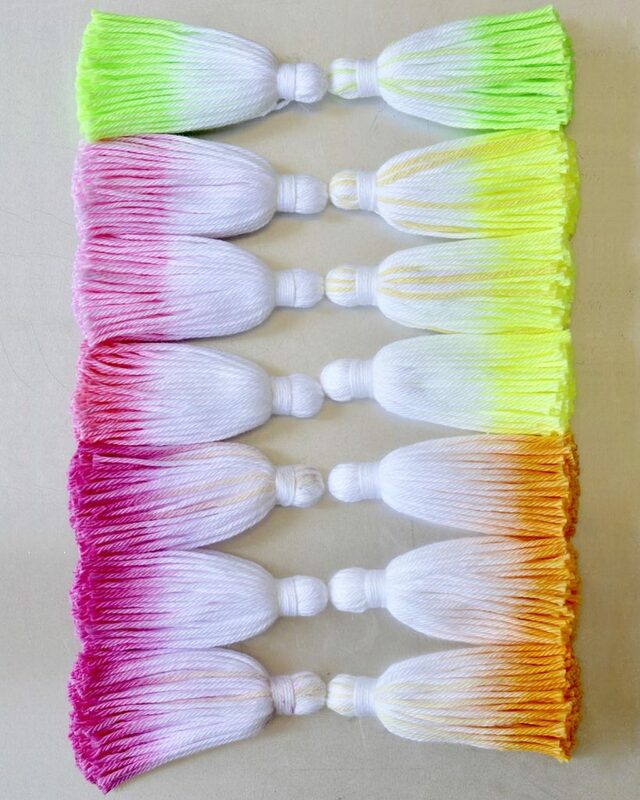 You will see a few strands of these frosting colors in my white cotton tassels. I am also using a bulky pale pink to wrap my hoop. When I tied my tassels to this hoop, I chose to use a cotton yarn that matched the pale pink, but you could also use contrasting colors for a more lively look. I used Rit All-Purpose liquid dyes in these colors: sunshine orange, neon green, neon yellow, petal pink, and fuchsia. For the cotton hanging strands, I used two white, one pale pink, and one pale yellow. I made a half and half pompom because I wanted to have the look of dip-dye. My vision was a modern, bright piece that could be used for a party, and then to brighten our summer porch! Cotton yarn(s) in colors of your choice – white and cream work best for dip-dying, though soft pastels also are fun when over-dyed. Look for a #4 (worsted/aran) weight. You can use either kitchen cotton yarn (inexpensive, rough/stiff texture) or a softer cotton yarn (slightly more expensive, but with smoother texture), but avoid mercerized yarn for this project. Acrylic yarn(s) in colors of your choice – these can be any colors that go well with your color palette. Any weight is fine. 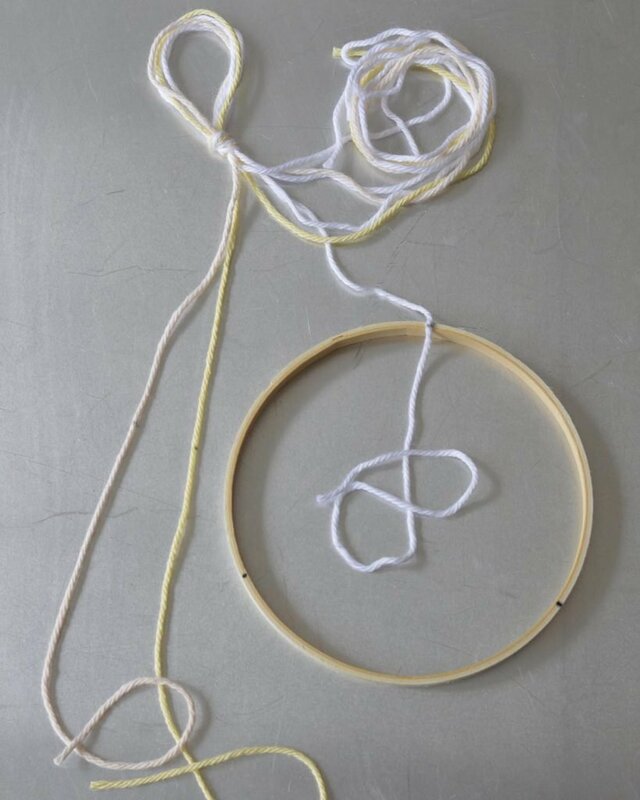 5 inch wood embroidery hoop – just the inner hoop will be used. 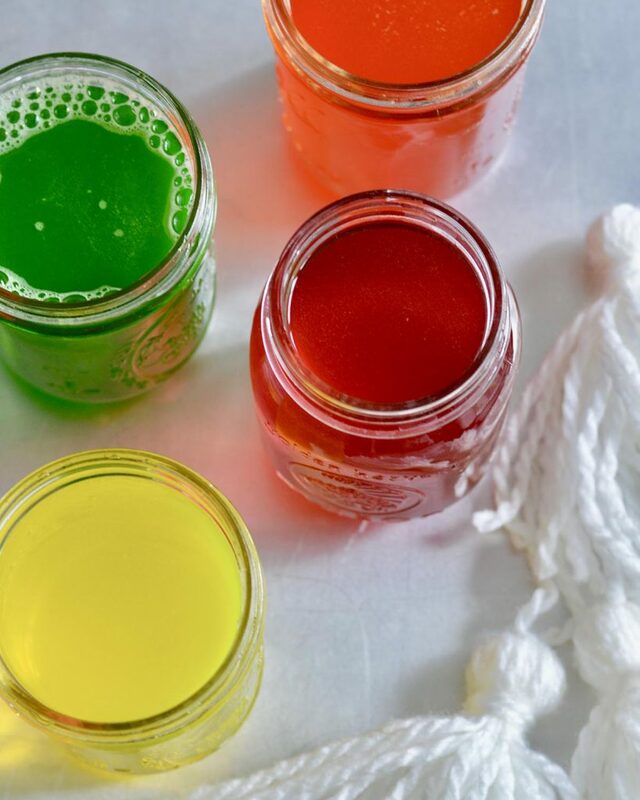 Fabric Dye in colors of your choice – RIT all-purpose liquid dyes work best with cotton, avoid Koolaid and food coloring dyes. 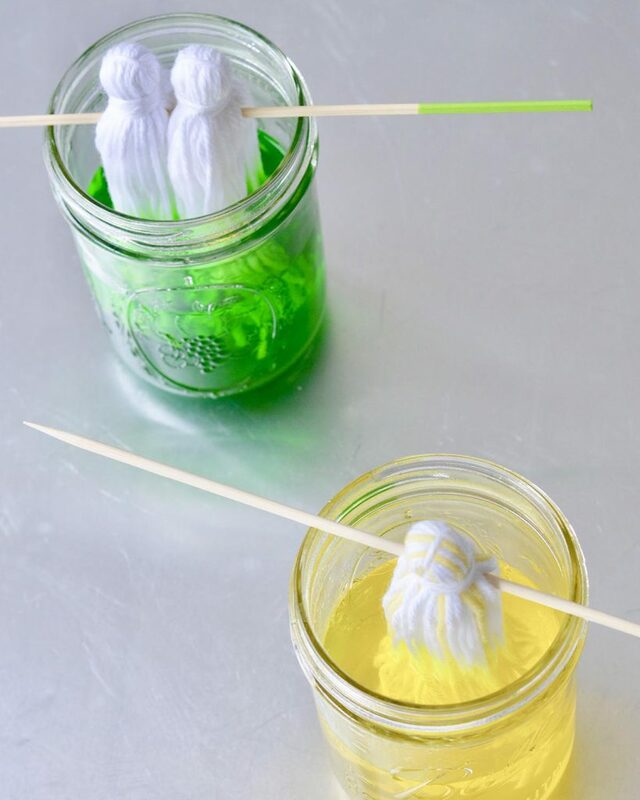 Containers for dye – mason jars work well, plastic may stain. 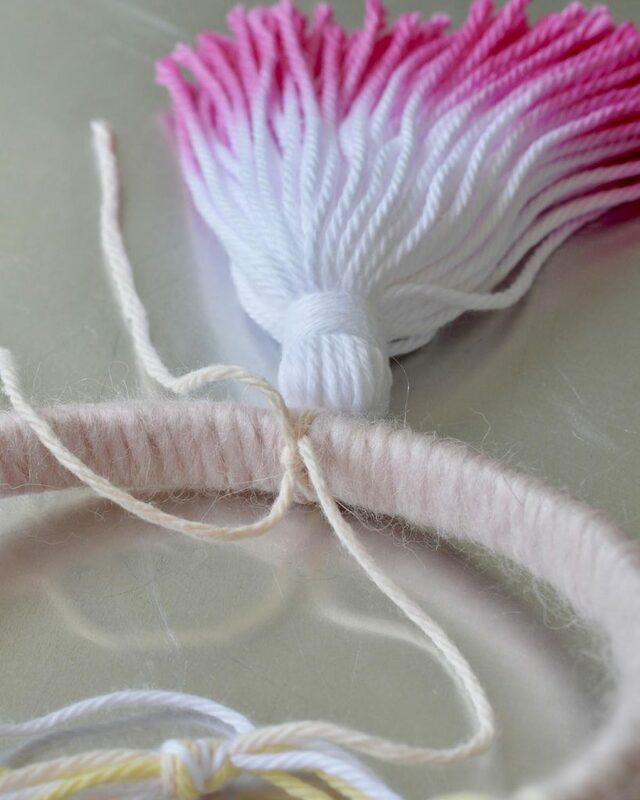 Using the TNTP method explained in How to Master Pom Poms & Tassels and your Loome tool, make fifteen 4.5 inch cotton tassels, wrapping the yarn about 60 times so that the tassels are chunky. Don’t trim the bottoms just yet. If you don’t have the Loome tool, cut a piece of strong cardboard 4.5 inches wide to use for Marisa’s tutorial. Add two inches of water and a drop of dish soap to a microwaveable container. Heat for one minute on high in the microwave. Place all of the tassels in the water so that their bottom halves are submerged. Let them soak while you prepare your dyes. Add one cup of water to each container that will be used for dye. Mix in 1 teaspoon of liquid dye and 2 teaspoons of salt, and stir well. Heat each container of dye for one minute on high in the microwave, then stir again. 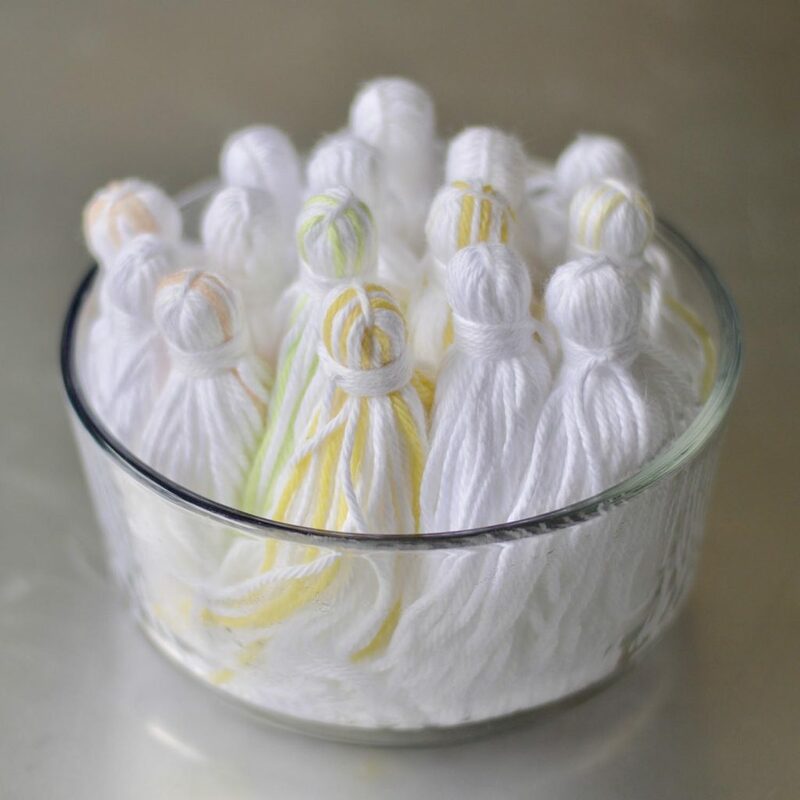 DYE TIP: Adding salt to the dye makes the colors more vivid when dip-dying cotton yarns. Remove the tassels from the water, rinse them, wring them out, and then lay them on one of the old towels. Roll up the towel, and press down to remove as much water as possible (but the tassels should still be slightly damp). If you don’t want dip-dyed hands, now is the time to don your gloves! 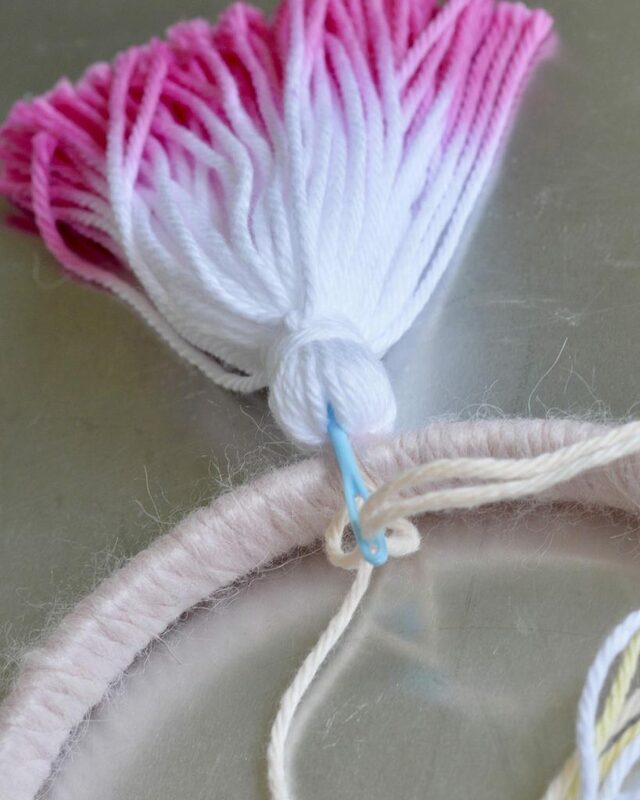 Holding the top of the tassel, dip about one-fourth of the tassel in the dye (the dye will climb higher up the strands, so don’t dip too deep). Hold the tassel in place for about 15 seconds (if you want to multi-task, you can use a skewer to hold your tassel in the dye), then lift it out to see how the color looks. Keep in mind that the color will be lighter once the tassel is rinsed (you can always re-dye if the color is too light after rinsing). Once you like the shade, rinse the tassel in the sink, under hot water. Be sure to rinse from the top of the tassel, so that the dye is running off the bottom and not going up into the un-dyed part of the tassel. Gently wring out the tassel, and lay it on a dry towel. 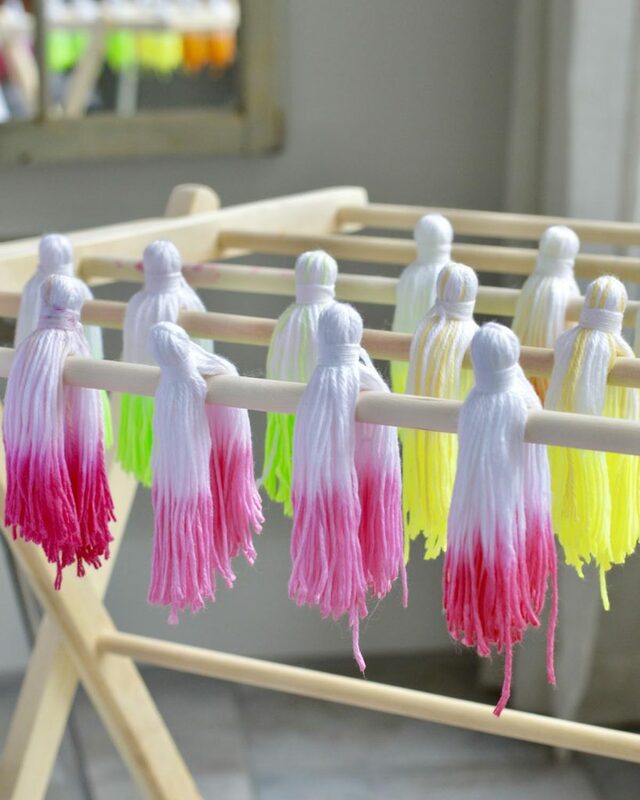 Continue this process until all tassels have been dyed. 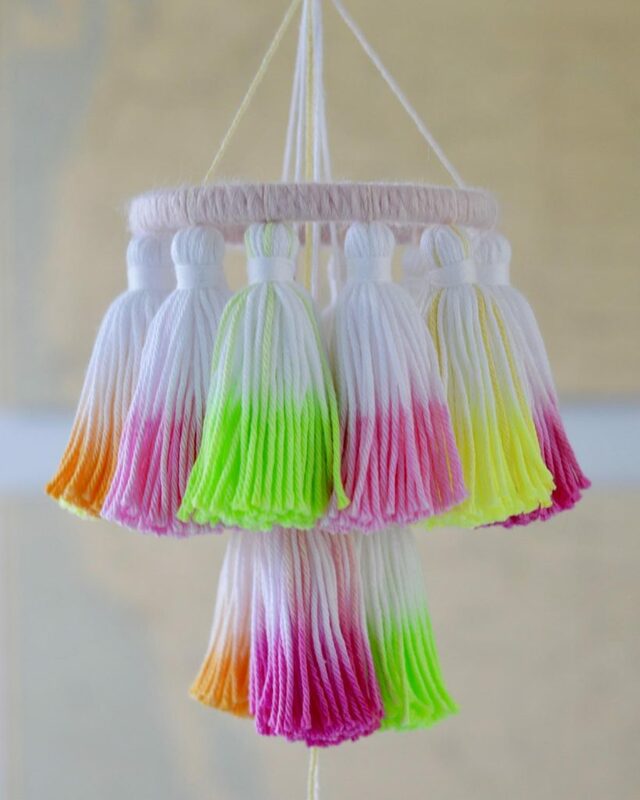 DIP-DYE TIP: If you want to have a consistent shade of a color on your tassels, note the amount of time you are keeping the tassels in the dye, and use a timer. 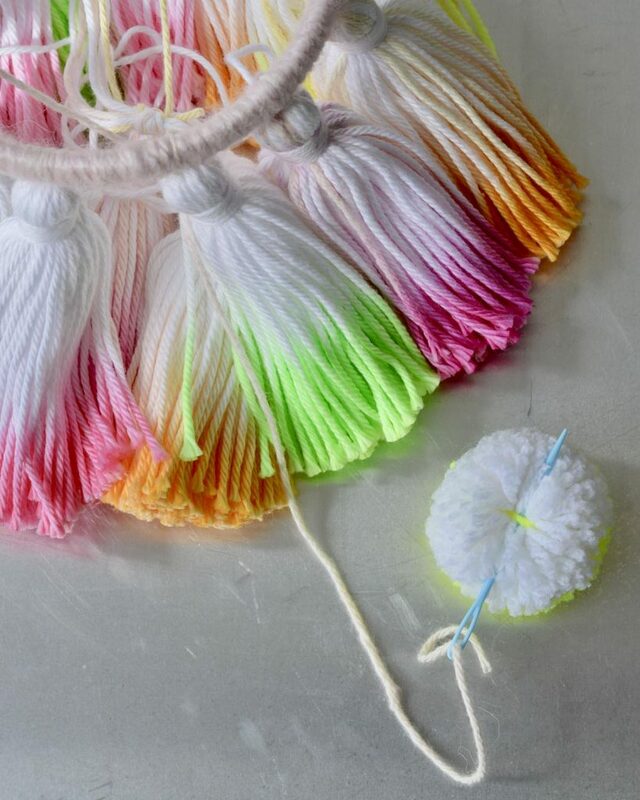 You can dip-dye a few tassels at a time if your container is big enough. 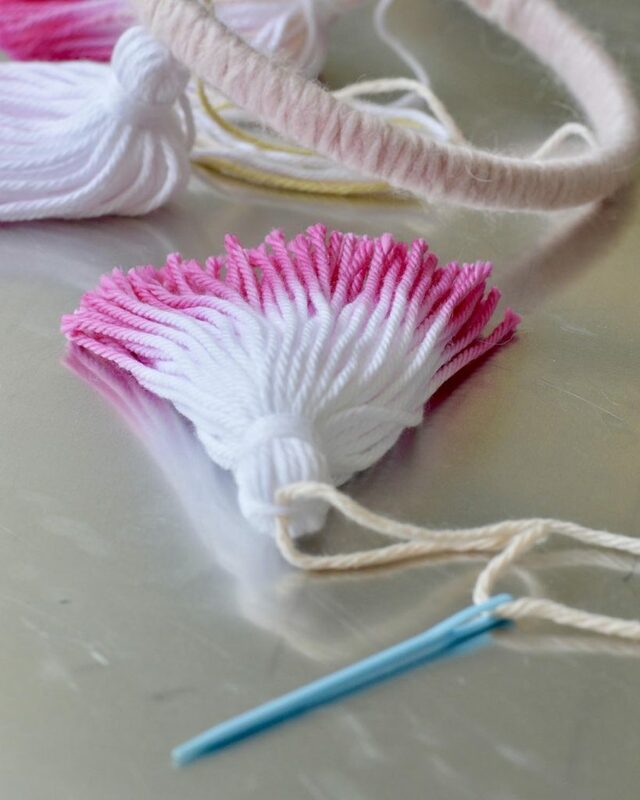 Roll up the towel(s) with the dip-dyed tassels, and press down to remove as much water as possible. Place the tassels on a dry towel to finish drying, or hang them on a drying rack. Once fully dry, trim the bottoms. Select one or more of your cotton yarns to use for the hanging loop. Cut four 36 inch strands. Keeping them together, fold in half to find the middle and make a loop knot that is about 2 – 3” long. Slide the loop over a finger on one hand, and then, one at a time, pull firmly on each strand until the strand is tight through the knot. Pick 3 of the outside strands. 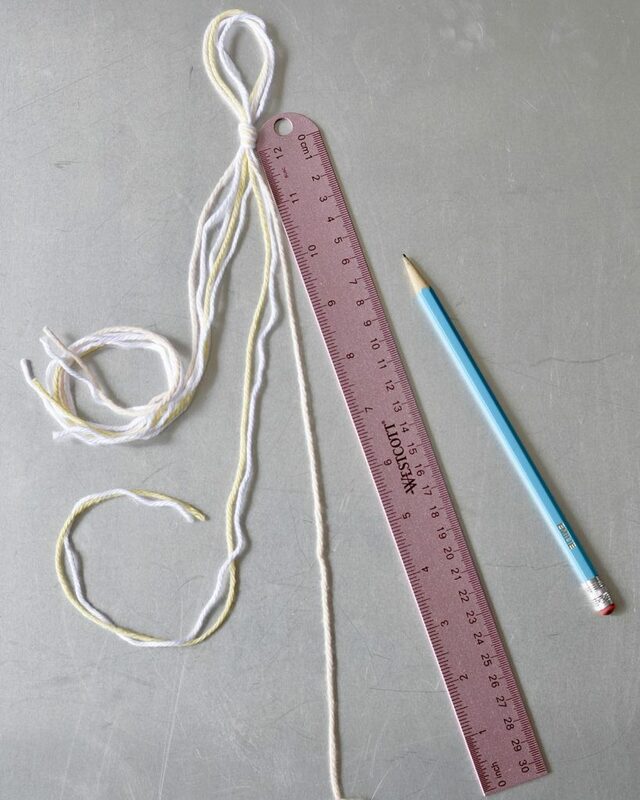 Measure 4.5 inches from the bottom of the knot on each of the three strands, and mark the spots with pencil. Make 3 equally spaced marks on the wood hoop – if you use a tape measure around the perimeter, there will be a mark every 4.5 inches. Tie the three strands to the wood hoop, matching the spots on the yarn to the spots on the hoop. If desired, glue the yarn knots to secure before trimming the ends to about one inch. It is important that the length of each yarn is the same so that the hoop is level when it is hung (adjust the length of each strand, as needed). 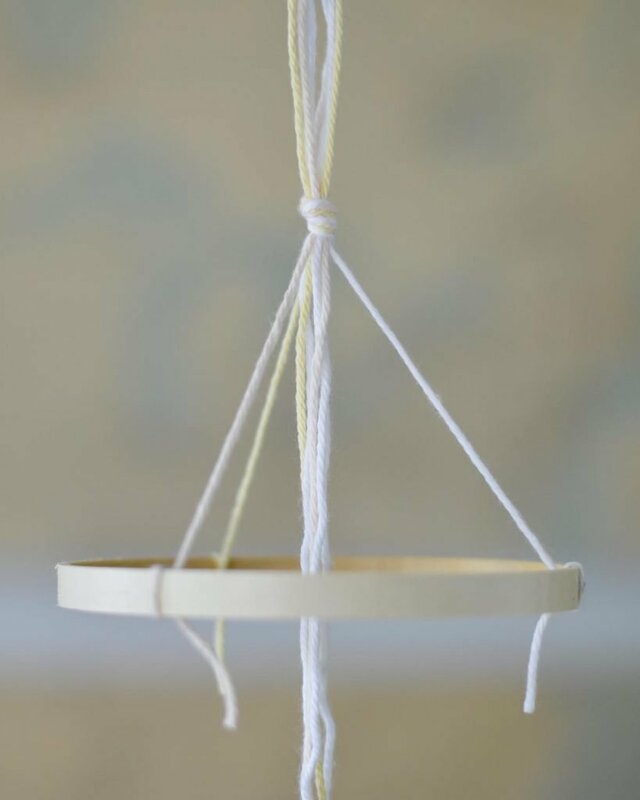 You should now have the 5 extra strands of yarn hanging in the middle of the hoop – do not trim these strands. Choose one of the acrylic yarns to wrap around the wood hoop – any weight of yarn will work, but the bulky ones are much easier (and quicker) to use. You can either use a glue gun to secure the beginning and end of the yarn, or you can knot it. When you get to each of the one inch strings (the ones that were trimmed from the hanging strands), hold the string against the hoop and wrap over it, so that it is hidden. Be sure to keep a tight, vertical wrap all the way around. Once your end is glued or knotted, trim the excess length. Cut twelve 8 inch strands of the yarn that you will attach the tassels to the hoop with. Thread a piece of the yarn onto the plastic yarn needle and thread the needle through the loop on top of the tassel. Do this for twelve of the tassels. Where one of the hanging yarns is tied, tie a tassel to the hoop and secure with a square knot. The tassel should be underneath the hoop, but tied snug to it, so there is no space in between the hoop and the top of the tassel. Gently pull the knot to the inside of the hoop. Thread both ends of the knotted yarn onto the needle, and push the needle into the top of the tassel. Make sure that the tassel has its front to the outside of the hoop when you do this. Pull the needle through to the bottom of the tassel, and trim the ends of the yarn if they extend beyond the bottom of the tassel. Repeat this process for the remaining eleven tassels – attach tassels to the other two spots where the hanging yarn is attached first. Then you will just be evenly spacing three tassels within each of the three spaces around the hoop. It’s pretty, right?! Find a spot where you can hang your chandelier – my spot of choice is the silver rhino head that hangs in my kitchen (that’s what the horn is for!). Thread one of the long strands from the loop knot onto the needle. Thread this yarn through the loop on top of one of your remaining three tassels, and remove the needle. Let the tassel hang in the center, and adjust it until you like the length… I like to have the head of the tassel above the bottom of the top tier of tassels, so there is about a one inch overlap. Once you like the length, tie a square knot on top of the tassel. Re-thread the end with the needle, and once again push the needle into the top of the tassel. Pull the strand through, and trim it. Repeat this process for two more strands and tassels. 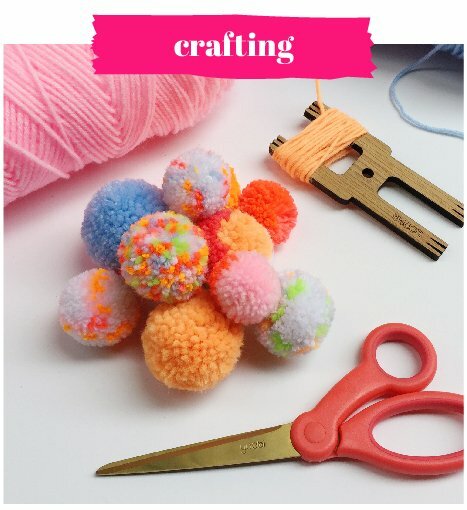 Using your Loome tool and TNTP tutorial, make a pompom using the yarns of your choice. A good finished diameter is just under two inches, but any size will add pizzazz! Thread another long strand onto the needle. Gently dig around in your pompom until you locate the center yarn that tied your pompom together. Push the needle under this center yarn, and remover the needle. Let the pompom hang in the center of the three lower tassels, and adjust the pompom until the length is good. I like the pompom to be just under the bottom of the tassels, but not touching them. Once the length is decided, tie a square knot at the center yarn, and trim the end. You should have one more long strand – trim this just under the top loop knot. Thanks so much to Marisa and The Neon Tea Party for hosting me – and thanks to you all for joining the fun! No, thank YOU Liz!!! Can you even believe how incredibly gorgeous this DIY is?? 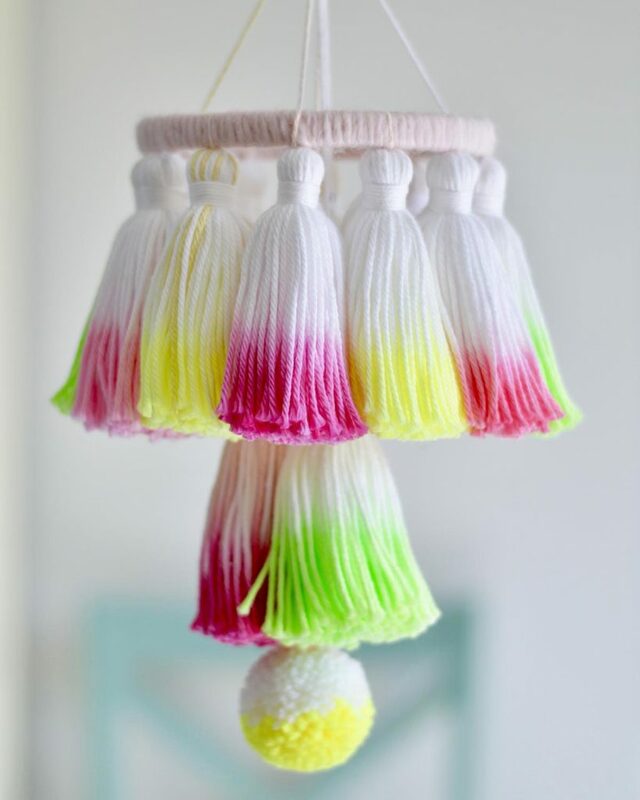 I don’t know about you but after reading this tutorial I want to dip-dye all my tassels and more! 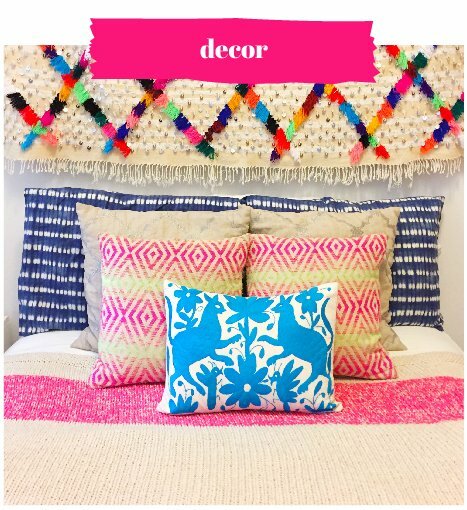 Don’t forget to go check out Fancy Flamingo Design on Etsy and Instagram, and be sure to take advantage of 10% off How to Master Pom Poms & Tassels with code FLAMINGO10 through 9/19!